I grew up between Tamworth and Gunnedah on a sheep, wheat and cattle property. This is where I developed my love of animals. I started work in Newcastle before heading over to the UK for a couple of years. I then returned back to Tamworth for a few years. In 1988 my wife and I came to the Nambucca Valley to work as a locum vet for 4 weeks and we never left. We now have 2 boys who have lived here their whole lives and are now off at university. I still have a strong interest in all farm animals but delight in the advances for all species. I really enjoy working in our existing team and enjoy the variety of cases and species we see. Outside of veterinary science I play soccer, swim, ride bikes and enjoy running. I graduated from the University of Queensland in 1996 and worked in Dubbo and Narromine in a progressive mixed practice that also provided an equine referral service and surgery. From there I spent 2 years in south-east South Australia where I focussed largely on livestock and horses. (Great wine down there but too cold!). Next on the agenda were adventures in South America and some locum work in the UK. I moved here in 2001 with my wife Karin and shortly afterwards we started our family which at last count numbered 5. When I find any spare time I tend to spend it training for triathlons, surfing or camping. 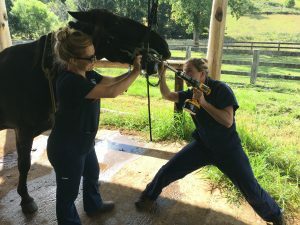 My particular interests in the equine field are horse breeding, foal medicine, equine dentistry and feet. While ultrasound (especially cardiology), dentistry and orthopaedics are the areas of small animal vet work I like to focus on. I grew up in country NSW and earned a Bachelor of Science from Sydney University and an Honours in Zoology from the University of Queensland. I travelled for 18 months overseas before beginning my long awaited journey through the wonderful world of Veterinary Science. When I graduated I worked in Maitland, the Hunter Valley and loved every minute of the job’s diversity. On many of my weekends off I also worked at the Newcastle Animal Emergency Centre. 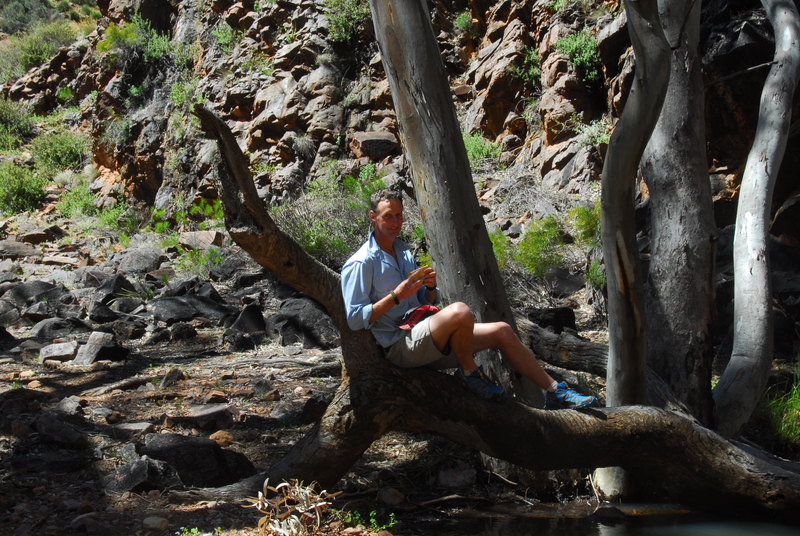 I left Maitland and worked for 6 months in the Southern Highlands before travelling north to the Mid North Coast. I’ve been here since January 2008 and I love the lifestyle, the climate, the animals and the challenge of everyday Veterinary Science. I have always had a strong interest in Avian, Reptile and Pocket Pet medicine. Every day I come to work I am in awe of the rich tapestry of the world of Veterinary Science. In my free time I enjoy cycling and hiking throughout the region. 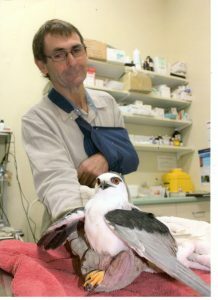 Having completed a year of Ag Science, I transferred to Veterinary Science at the University of Queensland and graduated in 1993. 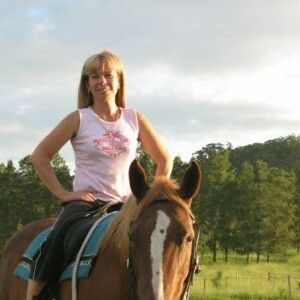 My first job was mixed practice based in Woodford in the Sunshine Coast hinterland and was a great way to start out. From there I headed off for the first of 3 stints in the UK (of which the island of Jersey was the standout location). Back in Australia I worked in Western NSW and South Australia before moving up here in 2001. As a family we have settled in and love the area and all it has to offer. I enjoy working with such a wide range of animals which I usually do on Mondays and Tuesdays in the Macksville Clinic. I grew up in central west NSW, and after graduating I returned to Western NSW to work in mixed practices in Dubbo and Coonamble. From there I spent the next 2 years locuming around Australia in almost every state, before settling into an Equine practice in south-east Queensland. My particular interests are equine reproduction and medicine, surgery and orthopaedics. In my spare time I enjoy surfing, running and travelling. I mostly work out of the Macksville clinic and really enjoy working with the enthusiastic and professional team. After graduating from the University of Sydney in 2015, I left the lights of the city for a lifestyle further north. Originally from a rural background in NZ, I now feel at home here on the mid-north coast with its plentiful beaches, beautiful rainforests and strong farming community. 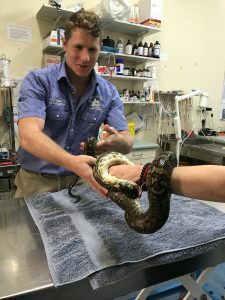 I enjoy all aspects of Veterinary practice, from the small fluffy and scaly pets through to the biggest of farm animals. The best part of being a Vet is being able to share my knowledge and skills to improve the lives of both the patient and the owners. After work I’ll often be found playing Touch footy or Oztag in Coffs Harbour and on weekends I enjoy trying to surf a few waves or escaping civilisation to sleep under the stars in one of our many national parks. 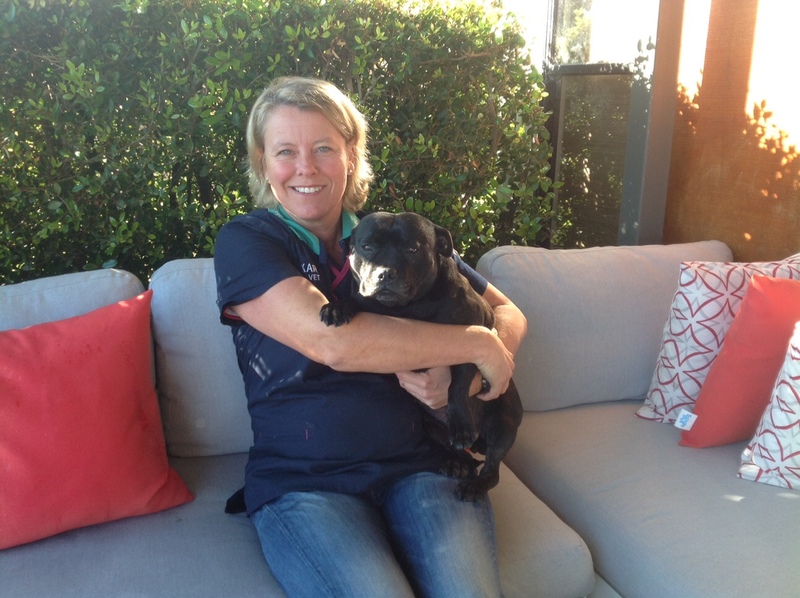 Robyn began working in Macksville 1997 as a qualified vet nurse from Tamworth. 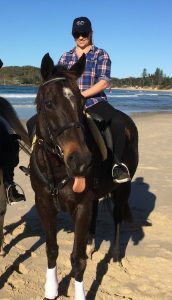 In 2012 she completed her Certificate IV in Training and Assessment and now completes on-line assessments with Open Colleges in Companion Animal Services and Veterinary Nursing. She also teaches with North Coast TAFE one day a week. 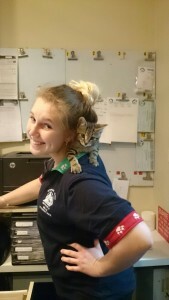 Robyn enjoys teaching as it gives her the opportunity to encourage students to understand what a privilege and rewarding career becoming a veterinary nurse really is. Robyn enjoys coastal life and spends a lot of time at the beach with her two beautiful Border Collies, Molly and Maddy, whom many of you have met over the years. 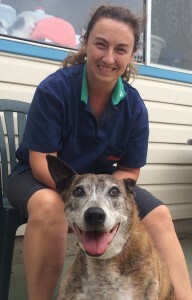 Michelle has been working at the Macksville clinic since 2003. She originally came from the Central Coast and is a fully qualified veterinary nurse. Her hobbies include horse riding, fishing and karaoke. Michelle has two great kids who are often found hanging out in the clinic. She has 4 cats including her favourite Mr Fluffkins. Being the newest member of the team I joined the clinic at the start of 2015. 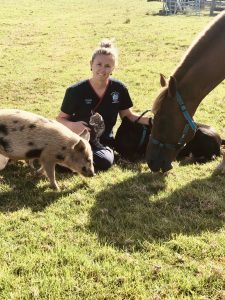 After completing my Certificate 4 in Veterinary Nursing and Certificate in Equine Nursing in late 2014, I was lucky enough to land my first vet nursing job at the Macksville Clinic. Becoming a vet nurse was one of the many goals that I aim to achieve during my life and it was great to find a job so close to home. I have recently bought a house in Kempsey with my fiancé, and I can’t wait to fill it with a huge variety of animals. I have started with Bruce the Oscar and Clarence the kitten. 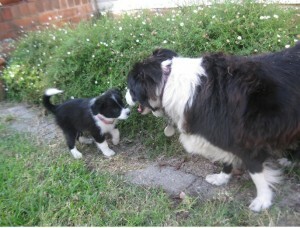 You will find me running Puppy Pre-School at our the Macksville Clinic. I grew up on a small farm on the mid north coast with lots of different animals. I have great love and passion for horses and love to show jump in my spare time. I also enjoy spending time with my 3 kids, Noah, Billy and Isla and my partner John on our small hobby farm. We have 2 horses Joey and Sunny, a miniature horse Bear, Henry the dog, George the cat, chooks, and our loving and hilarious mini pig Kevin Bacon.